The IM roads in the Netherlands are broken down into 221 work areas or districts. In each of these areas, a single recovery company is appointed to provide recovery services following accidents involving passenger vehicles. This page describes the IM road sections in each district and the recovery company contracted in that district. No rights may be derived from this listing. The contractual definition of the district boundaries is laid down in the document Landelijke Rayonindeling (National District Layout) 2019 – 2022*. 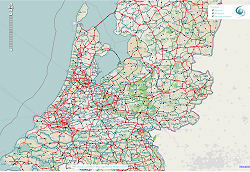 Stichting Incident Management Nederland also publishes an online map showing the location and district layout of the IM roads. Besides that, the location of the various districts is shown on the district maps of Stichting Incident Management Nederland. Stichting Incident Management Nederland is also responsible for passing on police reports of accidents on the underlying road network. The underlying road network ("OWN") is broken down into districts as well. For identifying these districts, the same district names are used as on the IM roads. The two layouts are however independent of one another. The district layout for the OWN network is also recorded on a detailed map. No rights may be derived from this map. (* Current version: version 8.05, situation as at April 8, 2019).